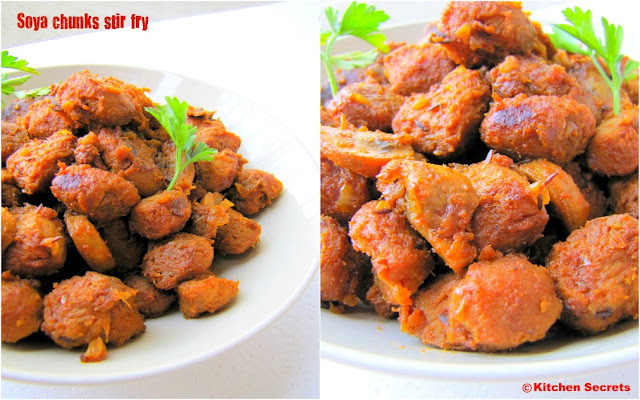 Soya chunks can be prepared in many ways, Infact, my mom's recipe involves grinding the masala's. Nowadays, I avoid grinding much since mostly my baby would be sleeping that time. 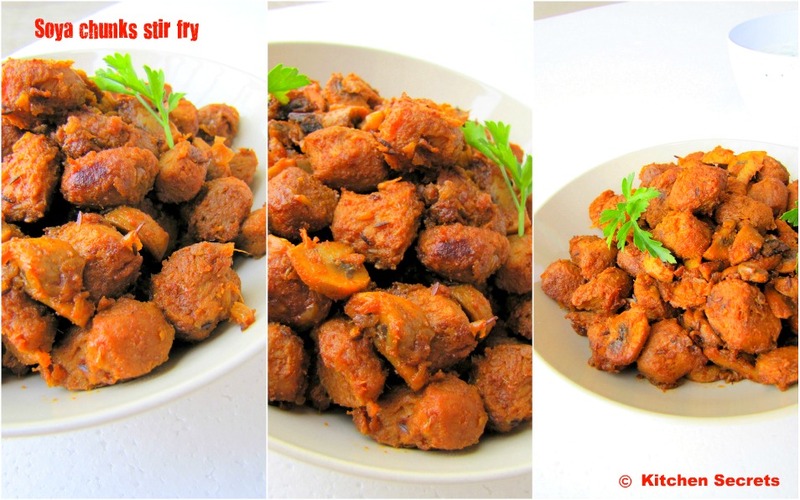 This is just a simple masala stir fry u can make in no time and simplicity makes this fry delicious..
Cook the soya chunks in hot water until it comes to a rapid boil and turn of f the heat. Let it sit in the hot water for 10 minutes. Later drain the water and squeeze the soya chunks to remove all the water that's been absorbed and place it on a plate seperately. Heat a kadai with oil and season it with whole garam masala's and cumin seeds. Later throw in the chopped onions and fry them . Now add the ginger garlic paste and finely saute till u get rid of the raw smell. Dump in the tomatoes and the curry leaves. Saute well again. Cook it covered until the tomatoes turn mushy. Open the lid, and add the turmeric powder, red chilli powder , chicken masala powder , salt and scald well the masala. Cook this mixture for a minute or so , add the chopped mushrooms . Scald well in the masala so that they start releasing water and make sure u get rid of it stirring often for few minutes. Throw in the squeezed chunks and combine well with all the maslas stuck to the pan. It's the best time to keep the heat in medium low and cover the kadai. Let it cook in the dum for 5 minutes so that the soya infuses some of the flavours from the masala. Continue to cook until everything gets dry and appears fried. Finally add the coriander leaves and serve.. Adding chicken masala powder is optional. Add the garam masala powder at last ,in case u avoid the whole masala. Very healthy and delicious combination.. looks amazing dear.. lovely clicks too !! hmmm mouthwatering fry and perfect with Rasam rice. delicious looking stir fry.love the plate fully. Stir Fry looks amazingly delicious and droolworthy. Great preparation. wow..loooks so yummy... perfect with paratha. I love soya in any form and this dish looks so yummy and colorful. Appadiye antha plate fulla yeduthukalama?? soo tempting and marvellous stir fry..
Looks fantastic & too too tempting!!! Healthy and yummy stir fry, looks very tempting. This is definitely a must try for me shanavi...Looks absolutely delectable!!! This stir-fry looks very delicious and awesome! Yum! Wow they looks so tempting,nice combo..will surely give this a try. My mother-in-law cook with soya chunks, i failed one time. looks dleicious, may be give a try. Delicious recipe......and the clicks are awesome!!! delicious fry ..... lovely clicks by the way !!!!! this is a wonderful way to use Soy chunks! Looks wickedly yummy! Protein packed delicious stir fry. Awesome combo..looks so so yummy!! you hv a lovely collection of recipes..loved the colorful shots..
stop by for a surprise in my space dear..
WaW lovely, spicy inviting stir fry out of soya chunks. Adding mushroom is a twist. Like it. Looks very tempting! Healthy dish. Do visit mine when time allows. Good recipe! That looks very delicious! 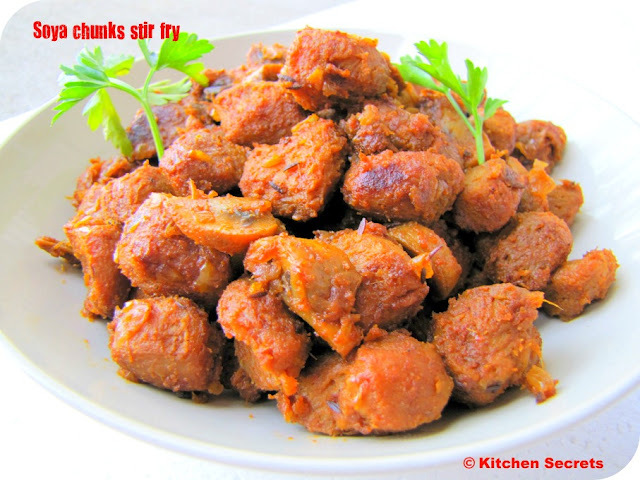 These soya chunks will surely like my kids, because I think this recipe was originally made for kids.